This was terribly prescient of Tolkien who, 50 years ago, began to see the light of the West pass its zenith. 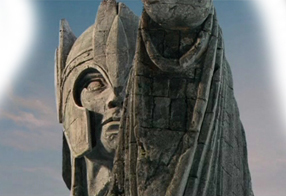 The King’s sword, Anduril, the “Flame of the West”, is shattered, and Minas Tirith, City of Kings, is Kingless, the throne occupied by a negligent and wicked Steward who would keep it for himself and deny “The Return of the King”. The armies of Mordor, many times more numerous, and with Haradrim from the South, press on to the city's destruction. In the words of the hero Aragorn, “They are an army bred for a single purpose: the destruction of the world of men." The great city has fallen into desuetude, neglect and disrepair. It no longer numbers its children. A stirring, a riveting drama to be sure: a vastly outnumbered remnant of a moribund society countenancing numberless hordes at the very gates – but in the end it is a fiction. No European country — none — has a replacement level birth rate, largely due to contraception and abortion. 18 have negative birth populations. We are a Capitalist culture. We have a penchant for numbers – These are sobering. More sobering still is the unremittingly doctrinaire, liberal mentality, legally sanctioned, that pushes a culture – the very matrix within which it was permitted to propagate as in a federally funded Petri dish – a mentality so rigidly disciplined to self-absorption, a cadre so hardened, as to mandate its own extinction because it is ideologically correct — and fails to see the madness in it.